The family-run business now has its products on the shelves of six hypermarkets. The firm was approached by Y International – the UK export arm of Lulu Group International which owns a chain of hypermarkets throughout the Middle East. The process of shipping fresh milk to the Middle East starts at the dairy where the milk is pasteurised. It is then transported in chilled vehicles to a temperature- controlled warehouse in Birmingham. Each bottle is then re-packaged with an Arabic label and palletised using special insulating material. It arrives at the airport on chilled vehicles and is air-freighted directly into the region’s central warehouse. 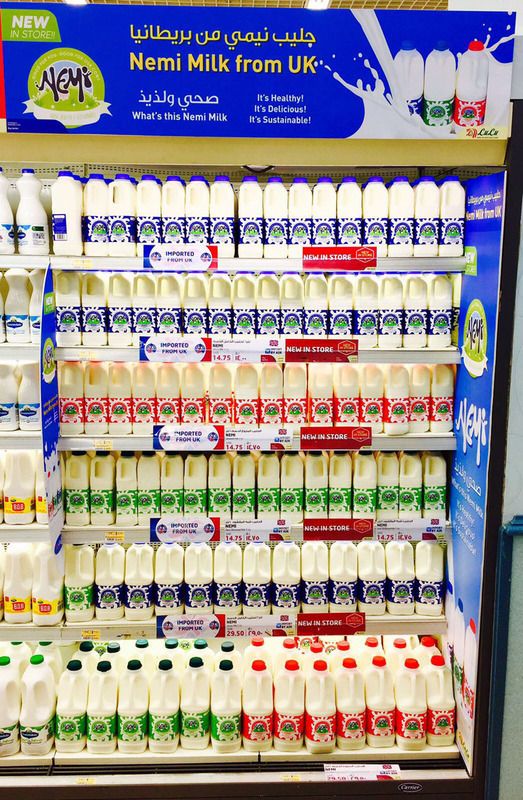 Throughout its journey, the milk is temperature checked constantly and never goes above 5 degrees C. Within days it is on the shelves ready for consumers to buy. Lulu Hypermarket chain is the largest of its kind in the Middle East. Currently, Lulu operates 134 stores and 14 malls throughout UAE, Qatar, Oman, Saudi Arabia, Kuwait, Bahrain, India and more recently Malaysia, with many more projects in the pipeline. The company’s tagline is “Lulu, where the world comes to shop” because the group is passionate about showcasing global products. Yaaseen Khalfey, perishables buyer also commented: “It is always best to work collaboratively with our suppliers and between ourselves and Nemi we have a great story to tell. Earlier this year, Y International UK won the Queen’s Enterprise Award; a royal seal of approval which recognises the company’s outstanding achievements in promoting international trade. For Nemi Dairy who guarantees to support British dairy farmers and want to develop a presence overseas, the two companies complement one another.